Quesadillas and running may not go together, but the nonprofit organization, Ngage New Mexico has made it a thing. 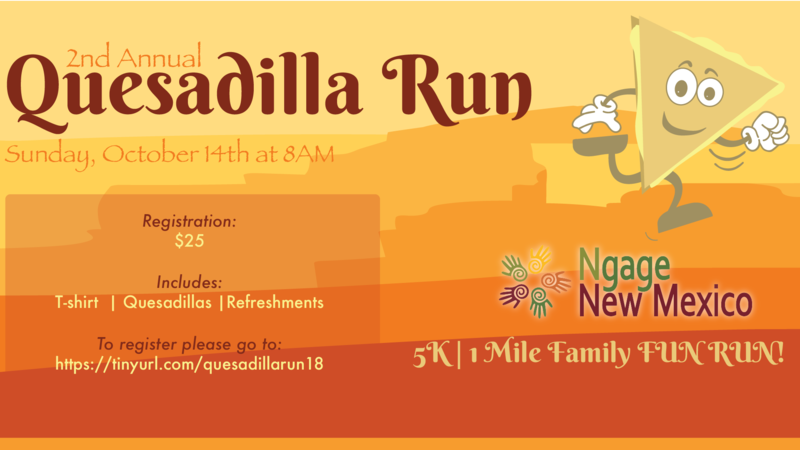 On Sunday, October 14, Ngage NM will be hosting its second annual Quesadilla Run, starting at 8am in Mesilla, New Mexico. The nonprofit is most known for its efforts for the prenatal to career, SUCCESS Partnership education initiative in Doña Ana County. Participants will have the option of a 5k run around Mesilla or a family fun one-mile run to enjoy the scenery. The $25 registration fee includes a t-shirt (supply is limited), refreshments from La Reyna Michoacana, and quesadillas made by La Luchador food truck. Awards will be given for the top three finishers by age group for the 5K run. Online registration closes on October 11 at 6pm. Registration will be available on event day. Participants can go to tinyurl.com/quesadillarun18 to register. For more information, email info@NgageNM.org.